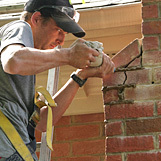 Chimney Solutions provides chimney repair & maintenance services for Canton GA and the surrounding towns of Kennesaw, Buford, Gainesville, Woodstock, Acworth, Alpharetta, and more. We have become the chimney sweep of choice for Canton, offering chimney repair services like chimney cleanings, chimney inspections, chimney liner replacement, chimney rebuilding, chimney cap installations, historic chimney restorations, and more. Residents across the Greater Atlanta area have come to trust in Chimney Solutions for all of their chimney & fireplace needs. Our excellent reputation and our devotion to superb workmanship and quality customer service have helped us become the chimney sweep contractor of choice since 1998. Every chimney technician is CSIA certified and trained so each job will be done to meet & exceed strict industry standards. Customers return to us every year to have us complete their annual chimney services. You can always expect us to arrive on time, in company uniform, and in a clearly marked Chimney Solutions vehicle. All throughout the town of Canton GA, up and down Interstate 575 and Rt 140 and along Riverstone Pkwy and Marietta Hwy, you can spot our company trucks traveling on their way to deliver chimney sweep services to local residents. From chimney cleanings to masonry repair, tuckpointing to chimney cap installation, and chimney liner replacement to firebox rebuilding, homeowners trust in us for all of their chimney repair needs. We stand behind every job we complete and each highly skilled technician has thorough knowledge about even the most complicated chimney issues. Customers have come to expect quick response times, fair quotes, and a full explanation of all recommended work so you can rest assured you are dealing with true chimney professionals. Chimney Solutions is a good standing member in both the National Chimney Sweep Guild and the Chimney Safety Institute of America so that we can stay current on best practices, industry standards, and new & innovative products. Homeowners - don’t get fooled by a common chimney sweep scam. Some companies advertise extremely low prices for common chimney services like cleanings or inspections, but these “cheap sweeps” will cost you way more in the long run! After a “cursory” inspection of your chimney system, they often report that your chimney is facing serious issues that must be dealt with immediately. They use this tactic to scare unsuspecting homeowners into agreeing to expensive and detailed repair services. Unfortunately, in most cases these repairs are unnecessary and not even required but since most homeowners don’t know the current condition of their chimney system, they take the “cheap sweep” at their word. Don’t agree to any expensive repair services without a second opinion from a reputable chimney sweep first. Not only are these “cheap sweeps” not true chimney professionals, but they often lack insurance and proper certifications. Don’t let the safety of your house and family rest on the work of unskilled labor, trust in a CSIA trained & certified, reputable chimney contractor. Our chimney sweep technicians provide repair & maintenance services for your fireplace, stove, insert, furnace, chimney, and venting systems in Canton GA and the Greater Atlanta area. Get the quality chimney services you deserve from chimney sweep experts. Contact us today to speak with our qualified chimney contractors.